One of the biggest mistakes we can make as Christians is to downplay our own sinfulness. Sin no longer has reign over our lives; however, we still can choose sinful behavior. The grace of God doesn’t give us more capacity to sin, rather it gives us the power to walk away from it. We must own up to our sinfulness in confession to God and to other mature believers if we are going to grow up spiritually. No matter where we are in our Christian walk, we will make mistakes. “There is no difference between Jew and Gentile, for all have sinned and fall short of the glory of God” (Romans 3:23). Only Jesus was born without sin, the rest of us were children of darkness until we came into the light of Christ. Our sinful nature will always draw us to fulfill the desires of the flesh, the temptations of Satan, and the longings of the world. Our remorse from sin must be tapered to conviction and not condemnation. We fall down occasionally just like other people and it can serve as a reminder for us to resist the urge of judging others when we ourselves have problems. “Those whom I love I rebuke and discipline. So be earnest and repent” (Revelation 3:19). Nothing escapes the eyes of God—not the good nor the bad things we do. Our mistakes are not surprising or hidden from Him. Just as a good parent will take the time to discipline a wayward child, the Lord (the best parent of all time) will allow discipline to train us towards becoming more like Jesus and not to destroy us. For every temptation we may go through, God has an escape plan to keep us from doing it. Many times we miss the escape because we are consumed with filling our own desires. However, true repentance always brings us back to the place where we first chose to sin. We need this to reflect how we could’ve avoided it as to not repeat it. God isn’t in heaven wringing His hands when we make mistakes. He saw it coming even before we were born. The Lord makes provision for us through His grace when we mess things up. His grace provides us with the strength, peace, knowledge, and desire to deal with our weaknesses and strive towards a victorious life in Christ. The Lord is in control even we are not. He is the master Orchestrator of life for the believer and the unbeliever. When we’ve made mistakes, He can turn around the most desperate of situations into something beautiful and meaningful. Our God loves us and He is able to make all grace abound towards us to turn our evil into good. “But I have prayed for you, Simon, that your faith may not fail. And when you have turned back, strengthen your brothers” (Luke 22:32). One of the greatest opportunities we have as believers is to help other people avoid our mistakes. However, this will require wisdom and transparency that may make us feel uncomfortable at first. Many people will be better equipped to make good decisions when they understand the consequences and costs of our mistakes. Don’t Stop at the Mistake! God uses our mistakes or sins to help us grow up spiritually. Through the gift of the Holy Spirit we are convicted of our sins, not condemned. Satan brings condemnation with regret, shame, and guilt. However through Christ we can be forgiven and restored back to right relationship with Him as well others. There is an aspect of this article that I struggle with, mainly the concept of making a “mistake”. My kid misspelled a word, I couldn’t remember what my wife wanted from the store and got the wrong product or I put the wrong oil in the car. These are mistakes. I do not believe they are sins, but are a result of a sin nature that causes me to be imperfect in every aspect of my life. At the same time, I do not confess these things because they are not a violation of God’s will, they just show me how dependent I am on Him. With that said, I’m not sure the “mistake” is the best word for what you are describing. Maybe I’m wrong. Could you help me clarify this in my mind. Thanks. I understand where you are coming from and it was the dilemma in writing this article. Because our culture commonly intertwines “mistakes” with what we would call “sin”, I felt led to write this article with the mindset of someone whom the Lord wants to save, deliver, and use for His purposes but they are enslaved by their sins. You are correct in your conclusion that making a mistake (i.e. 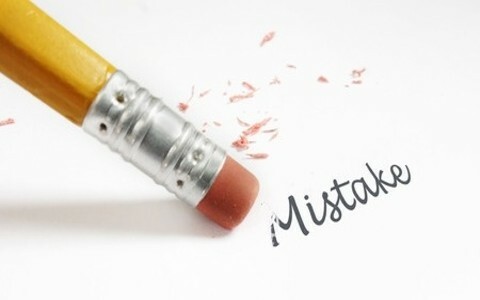 forgetfulness, errors) are not the same as intentional sins. As with you, my mistakes drive a greater dependency on the Lord. I hope this answers your question and I appreciate your comment as it was a difficult title to build a blog on, but I believe the Lord will use it (with all my mistakes) for His glory to free the captives–Is. 58:6–my mission verse in writing and speaking. God bless you! Please help me with an issue Iam having. A pastor I know has said more than once, we need the Holy Ghost to show us we are wrong, ok. I agree. So, if Iam wrong does that mean I don’t really have the Holy Ghost? Am supposed to be perfect to keep the Holy Ghost? If I search myself, ask forgiveness am I still filled with the Holy Ghost ? Have I never maybe even had the Holy Ghost ? Have I been lying to myself? As you can see, his words have really confused me. I want to please God. I don’t always act the way I should. I pray and ask for help and forgiveness. This pastors words really bother me. Am I just being rebellious ? Stubborn? Do I have to continually seek to be filled with the Holy Ghost???? Am I simply misunderstanding the man of God?? Hummmmm? Maybe? Lol see, I do have a sense of humor! It’s just that I feel condemned . No, the Holy Spirit abides with you forever just as Jesus and the Father will not allow you to be lost (John 10:28-29) but it is not the Holy “Ghost” but the Holy Spirit. God is spirit and not a ghost. No, your pastor should have told you more clearly what this means. We all sin but are still saved. Read Romans chapter 7 to see Paul’s struggle. Next post: The Herods In The Bible – Do You Know Them?